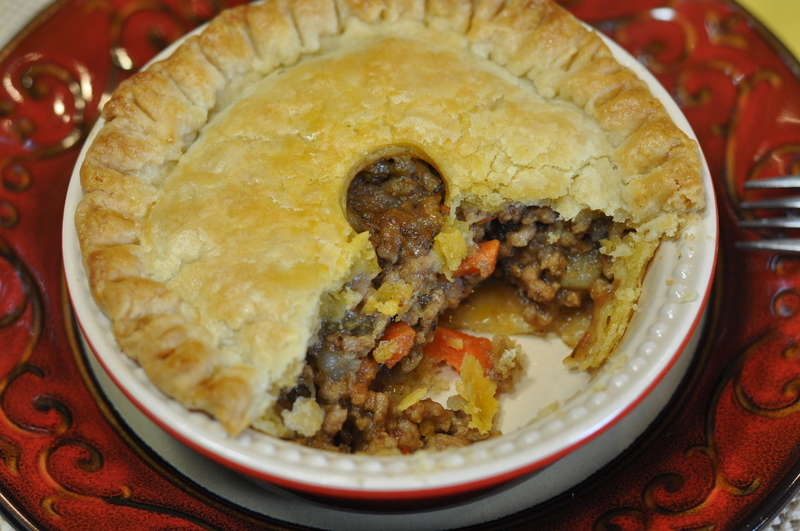 The inspiration for this pot pie is the French Canadian dish known as tourtiere, the main difference – with apologies to our northern neighbors – being a bit more oomph in the seasoning department than traditional recipes. The oomph I’m referring to – the magic that adds a rich, deep flavor to the ground meat mixture – arrives by way of the chili sauce, Worcestershire, mustard and an unexpected combination of sweet spices you don’t normally find in savory dishes. It’s important to simmer this saucy mixture to just the right consistency. 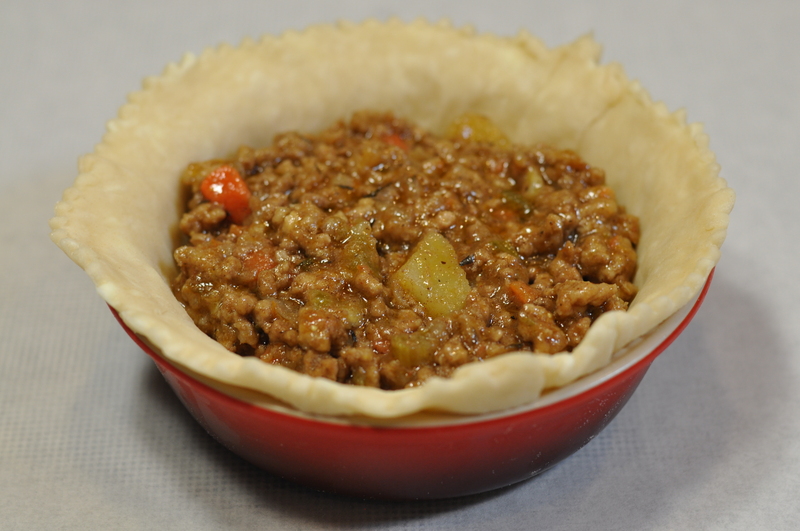 You want it to be full bodied and saucy, but not so thick that the interior of the finished pot pies ends up too dry. If anything, err on the side of a little too saucy. First thing you’ll need is a two batches of GOOD BASIC PIE DOUGH. As soon as it is made, divide it up as outlined in the recipe. While the disks of dough chill, go ahead and prepare the meat mixture. It will need time to cool while you’re working on the pastry. You will need six individual-size, mini pie pans. I like my Le Creuset mini pie pans. These are typical of mini pans in that they have a capacity of about 1 cup and measure about 4 1/2″ across. Lacking those or similar dishes, you can always use a muffin pan with large cups. On the upside, muffin cups make attractive little pies…and you can transport them right in the pan itself if, say, you are headed to a tailgate party. You can reheat by putting the entire pan on an outside (closed) grill and away from direct flame or heat that’s otherwise too intense. You don’t want to damage the pan. On the downside, muffin cups tend to be narrower and steeper than other pie pans, making it a little trickier to line the pans with the dough. You’ll need to be patient with the process and use a gentle hand. Also, the finished pies do not come in their own individual dishes, but you can simply serve them on attractive plates. Here’s a trick if you do use muffin cups: lay crisscross strips of wax paper in the cups before lining them, as shown below, so you can lift the pies out easily. Otherwise you may damage the crusts when you try to get them out later. Pot pies like this are what I think of as a “craft cooking” – the sort of dish that engages the senses and offers tactile rewards. You don’t dash these off for a quick dinner; rather, you putter away at these over the course of a few weekend hours when you’re going to be around the kitchen anyway, enjoying the process as much as the result. I love that kind of cooking. These pot pies can be the centerpiece of any hearty winter meal. I would serve them accompanied by a big, colorful salad and a light dessert – maybe stewed fruit or cold custard. They’ll freeze well and can be thawed and/or reheated in the microwave, provided they’re in microwave safe dishes. I think you’ll really enjoy these; let me know. PASTRY NOTE – You will need 2 batches of the GOOD BASIC PIE DOUGH, divided as outlined in the recipe below. FOR THE PASTRY: Divide the first batch of dough into 4 equal pieces. Shape into disks about 1/2" thick. Wrap separately and refrigerate. Divide the second batch of dough in half, making one half slightly larger than the other. Shape, wrap, and refrigerate the larger half; you'll use that portion for your top crusts. Divide the slightly smaller portion into equal halves. Shape into disks, wrap and refrigerate. You now have 6 more-or-less equal-size disks of dough for your shells, and a larger disk of pastry you'll roll and cut for your tops. MAKE THE FILLING: Melt the butter in a Dutch over or other heavy casserole. Stir in the onion and celery and saute the vegetables over moderate heat for 5 minutes. Add the garlic and meat. Brown the meat for several minutes, stirring often, then stir in the beef stock, potato, carrots, salt, thyme, paprika, cinnamon, cloves and pepper. Bring the mixture to a simmer. Cover and simmer gently for 10 minutes. 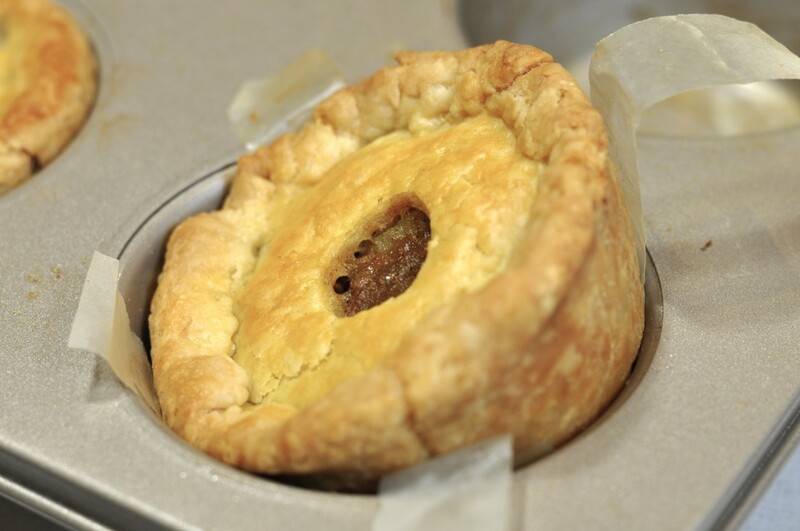 Drape the pastry over your pie plate or muffin cup and gently tuck it into the pan down to the seam. There should be no gaps. If you happen to puncture the shell, you can use the scraps to patch it up.) Let the overhang simply drape over the sides for now. Repeat for the other pans. When all the pans are lined, place them in the freezer for 15 minutes or in the fridge for slightly longer, to firm the dough. Preheat the oven to 375°. While the shells chill, lightly dust the remaining disk of dough with flour and roll it into a circle - slightly less than 1/8" thick - on a floured surface. Using a cutter or template that's as large as your pan's diameter, cut the pastry into 5 circles. Gather the scraps, roll them also, and cut a 6th top pastry. Spread these on a baking sheet and refrigerate. To assemble, divide the cooled filling equally between the 6 shells, smoothing the top with a spoon. Cut a small hole in the center of each top pastry, then lay one on top of each pie. When the overhanging dough is flexible enough to handle, moisten the overhang of each pie with a damp fingertip and fold it over the top pastry. Pinch to seal and form a rope-type edge. Flute edge if desired. Lightly brush the top pastry of each with a little glaze. 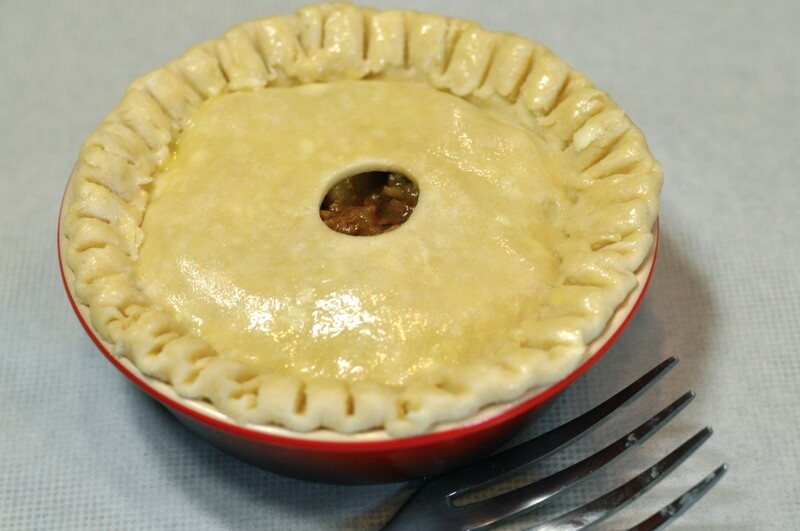 Bake the pies on the center oven rack for about 40 to 45 minutes, until the pastry is golden and the filling is bubbly. Cool on a rack for about 15 minutes before serving.